38 weeks of hands-on learning! Looking for a homeschool preschool curriculum for your child? 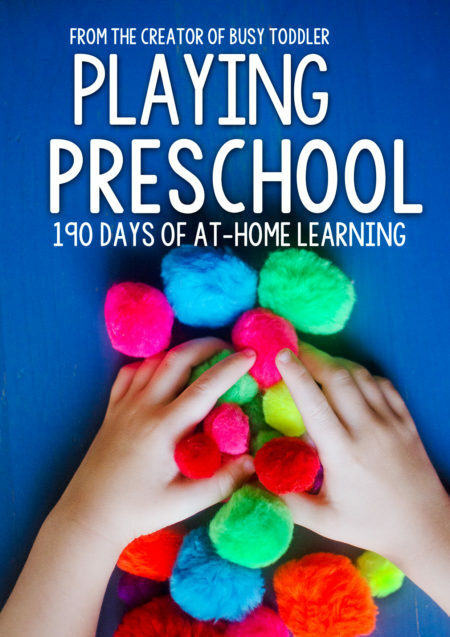 Meet Playing Preschool Year 1: a new way to preschool at home. This is a 190 day program of hands-on, play-based learning. Themed units anchor the learning as children explore math, reading, science, art activities, and much more! 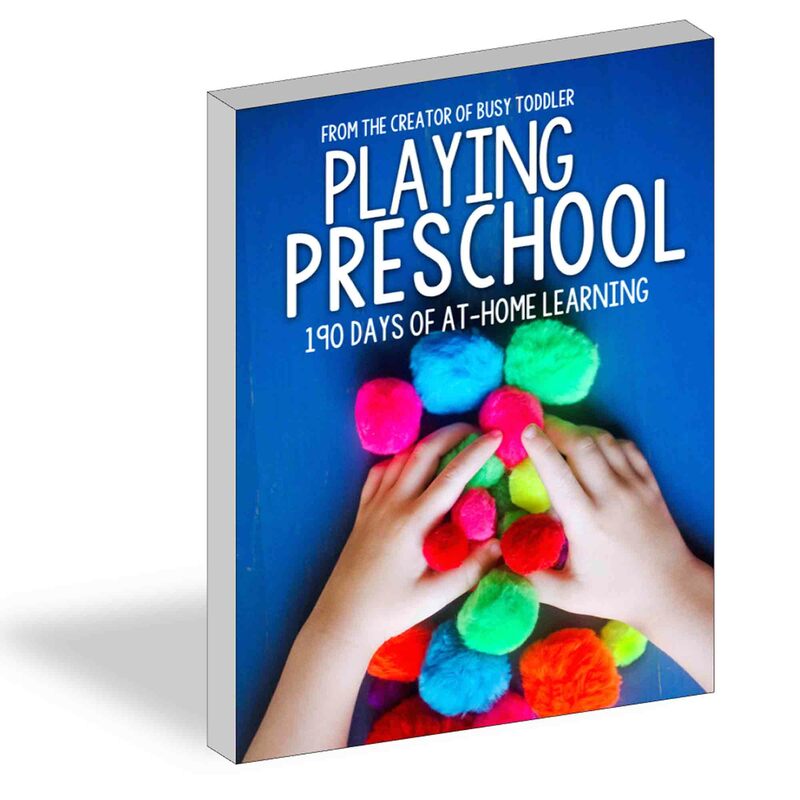 The listing is for Playing Preschool Year 1: 330+ pages, all 19 thematic units, and the must-have Start Up guide. The Playing Preschool Program is protected under copyright © 2017 Busy Toddler LLC. QUESTIONS? Please email susie@busytoddler.com. Welcome to Playing Preschool Year 1! **THIS PRODUCT LISTING IS FOR THE PLAYING PRESCHOOL YEAR 1 CURRICULUM PLUS 20+ PAGE START UP GUIDE. ***THIS IS NOT A PHYSICAL PRODUCT. THIS IS A DOWNLOADABLE PRODUCT. ***YOU ARE PERMITTED TO PRINT ONE COPY OF PLAYING PRESCHOOL YEAR 1 FOR PERSONAL USE, NO REDISTRIBUTION***PRINTING IN BLACK AND WHITE IS HIGHLY RECOMMENDED FOR COST SAVINGS** QUESTIONS? Please email susie@busytoddler.com. Are you ready for 190 days of learning? From the creator of Busy Toddler, this is a new kind of homeschool preschool curriculum. Fast, easy, and affordable. Playing Preschool Year 1 is a 19 unit curriculum designed to introduce children to a variety of learning concepts in a fun and exciting way. 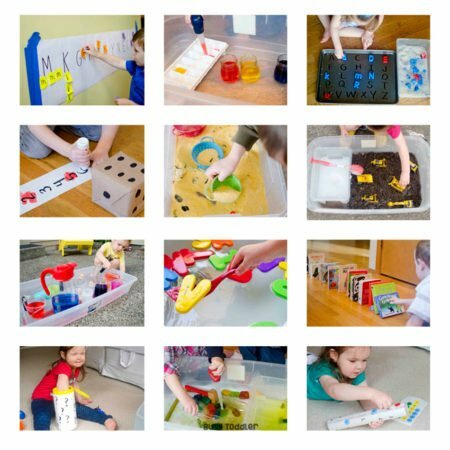 This program is play-based, hands-on, and designed for at home use. 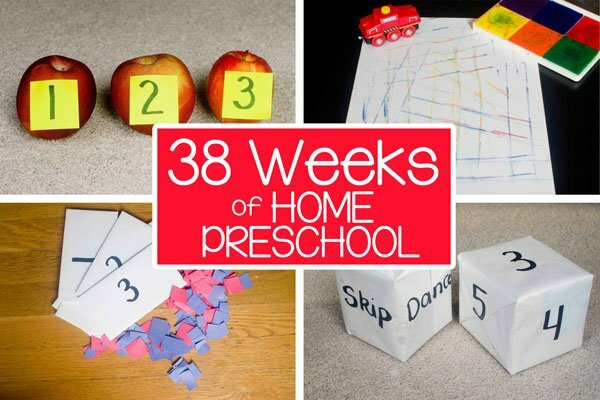 Playing Preschool is “evergreen” so you can start this program at any point in the year! This program is not time consuming. Each day takes about 45 minutes. This program is not sit and do work. These activities are all about moving and playing. This program is not going to cost you an arm and a leg to set up. 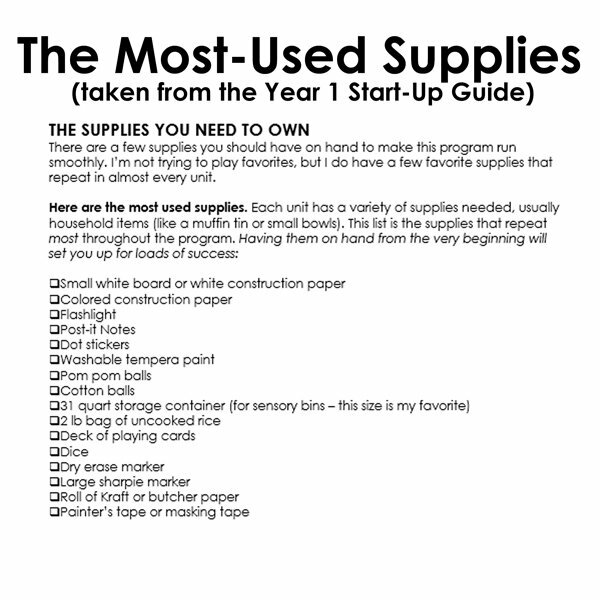 Most supplies are already found in your house. For even more detailed information about the Playing Preschool Program, check out this giant post. What age is Playing Preschool Year 1 designed for? Playing Preschool Year 1 is designed for children ages 2.5 – 5 years old. The program is incredibly open-ended and full of opportunities to adjust the level of activities to meet the needs of the specific child. My children were 2.5 and 4 year old when I wrote this program and they both learned so much. I was very deliberate in designing a program that can be used with multiple ages of children. You’ll even find my “extension” notes throughout the program with my ideas for how to extend the activity. 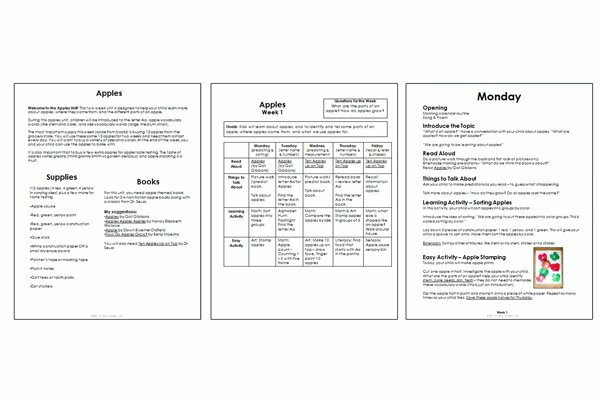 It’s a homeschool preschool curriculum built on simple, engaging, and active play-based learning. Each unit in Year 1 is two weeks long so it’s a 330+ page program with 190 days of activities. And that’s what this is: educational activities, full of learning but without the pressure or length of typical school. Plus, there’s a clear sequence and progression of skills in this program so as children grow and develop, so do the activities. 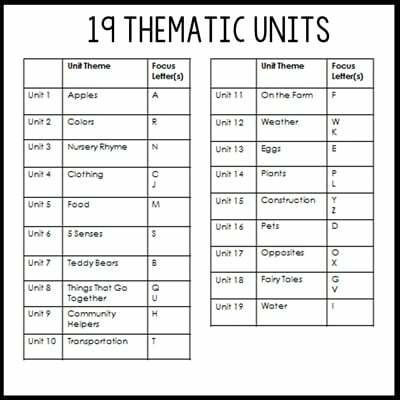 You’ll notice quickly that the activities in Unit 19 are a lot more challenging than in Unit 1. But that’s not all! This program is full of science activities, fine motor skill, gross motor activities, art and sensory based activities. This program is so much more than just straight academic learning. 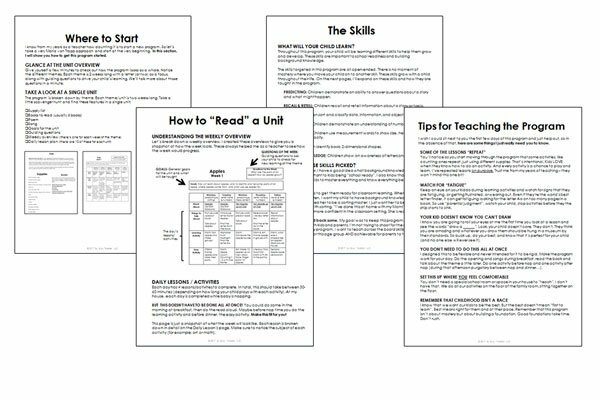 It’s about building background knowledge of key skills and information that will help your child in their “school years.” The 19 topics introduce your child to so many important and new concepts, ones they may not have considered yet. I hear you and that’s great! Many of the alphabet activities in Playing Preschool are ones I used as a first grade teacher – because even seven year olds who are fluent readers still need these kinds of alphabet lessons. As for counting, number sense is so much more than that – even in high school calculus students are using number sense. What we are working on in Playing Preschool is moving beyond memorizing. It’s fairly easy to memorize the order of numbers or letters in the alphabet (it’s actually similar to identifying animals – you are learning the name of an object and the sound it makes: “That’s a cow. It says ‘moo.’” “That’s an Aa. It says /aaa/.”). What we want is for our children to go beyond memorizing. We want them to understand letters as a building block and tool for reading. 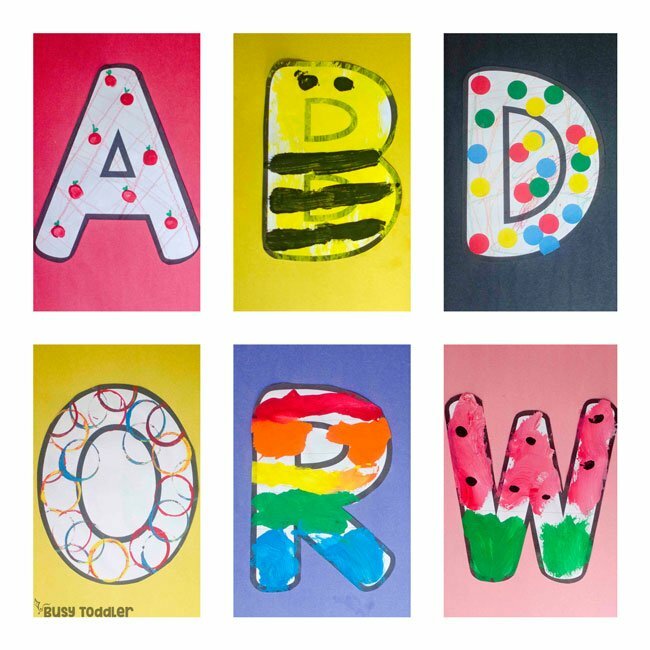 To see letters in the world around them and to form a base for when they are ready to read. We want our kids to really know their letters. With numbers, it’s so much more than counting. It’s understanding value, comparing numbers, and using numbers to measure and discuss data. Remember: repetition and practice are a good thing. It’s important. And think of it this way – just because our kids know their animal names doesn’t mean we stop going to the zoo or reading and learning about animals. Think of letters and numbers similarly. First of all, I created an amazing 20+ page start up document so I can show you the ins and outs of this program. In the start-up guide, I’ll share with you my tips and tricks for teaching Playing Preschool, because I know what it’s like trying to learn a new curriculum. I want to give you all my teaching knowledge to help you (and your child) be successful. Each week has a unit overview so you’ll get a snapshot of how the week will look. Each day has a detailed lesson plan so you’ll have clear directions for how to teach your child. 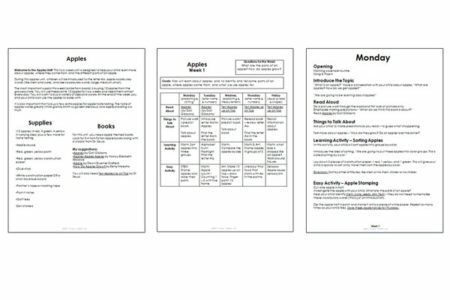 Need to see more about this homeschool preschool curriculum? Check out this post on Playing Preschool or email susie@busytoddler.com. 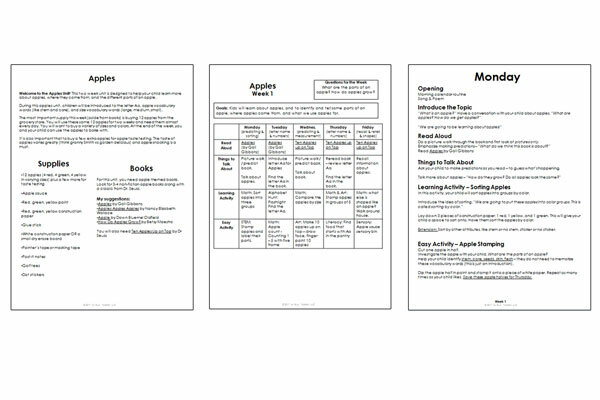 You can also check out this free sneak peek of Year 1, Unit 1: Apples to see the flow and set up of this amazing product! This is a digital product and is non-refundable. You will receive a .PDF at checkout.